Now you are going to recreate the disc by partitioning and formatting it. Use "create partition primary" to create a new partition. 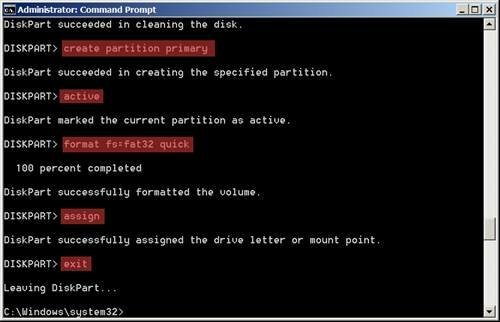 Then type "active" to make this partition active and finally "format fs=fat32 quick" Once done, you simply type "assign" to assign a drive letter to teh newly formatted USB memory stick and "exit" to leave Diskpart.